North Carolina State University will receive $12.4 million over the next four years from the Bill & Melinda Gates Foundation to improve a crop that is an important food staple in sub-Saharan Africa – the sweet potato. The grant will fund work to develop modern genomic, genetic and bioinformatics tools to improve the crop’s ability to resist diseases and insects and tolerate drought and heat. Sweet potatoes are an important food security and cash crop with potential to alleviate hunger, vitamin A deficiency and poverty in sub-Saharan Africa. More than 13.5 million metric tons are produced in sub-Saharan Africa annually; they are predominantly grown in small plot holdings by poor women farmers. A priority crop for the Gates Foundation’s Agricultural Development Program, the sweet potato has a complex genetic blueprint. Lack of knowledge about the crop’s complex genome and lack of modern breeding tools for the crop currently hamper efforts to expand production. Dr. Craig Yencho, an NC State professor of horticultural science who heads the university’s sweet potato breeding program in the College of Agriculture and Life Sciences, is the project director. 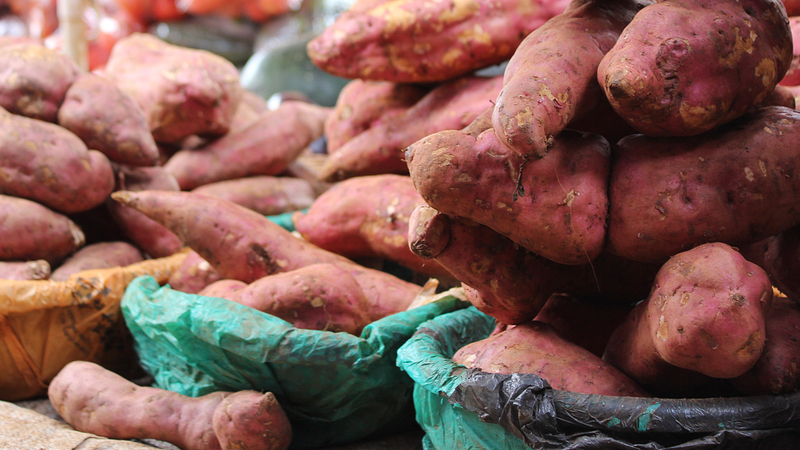 He says that sweet potatoes have a number of valuable characteristics that make them an attractive African crop. He adds that – besides the crop improvement work – it’s important to build a network of young scientists who can use the new breeding tools and techniques built in this golden era of genomics. Chancellor Randy Woodson praised Yencho’s work on sweet potatoes in Africa and in North Carolina, which leads the United States in sweet potato production. Woodson added that the $12.4 million grant is the latest example of continually increasing private support for NC State as the university prepares to launch the most ambitious fundraising campaign in its history. “This type of generous support enables NC State to extend the impact of our life-changing work across the nation and throughout the world,” he said. NC State co-primary investigators include Dr. Fred Wright, professor of statistics and director of the Bioinformatics Research Center; Dr. Dr. Zhao-Bang Zeng, William Neal Reynolds Professor of Statistics and Biological Sciences; Dr. Dahlia Nielsen, associate professor of biological sciences; Dr. Jennifer Schaff, director of NC State’s Genomics Research Laboratory; and Dr. Lina Quesada-Ocampo, assistant professor and extension specialist in plant pathology. Partners on the grant include the International Potato Center; Michigan State University; the Boyce Thompson Institute at Cornell University; the University of Queensland; the National Crops Resources Research Institute in Uganda; and the Council for Scientific and Industrial Research in Ghana.